This entry was posted on 2011-03-17 02:55:44 and is filed under Android, Java, Programming. You can follow any responses to this entry through the RSS 2.0 feed. You can leave a response, or trackback from your own site. There’s been quite a bit of activity on this post. Some of the info is old, and people keep asking for the full Eclipse project. 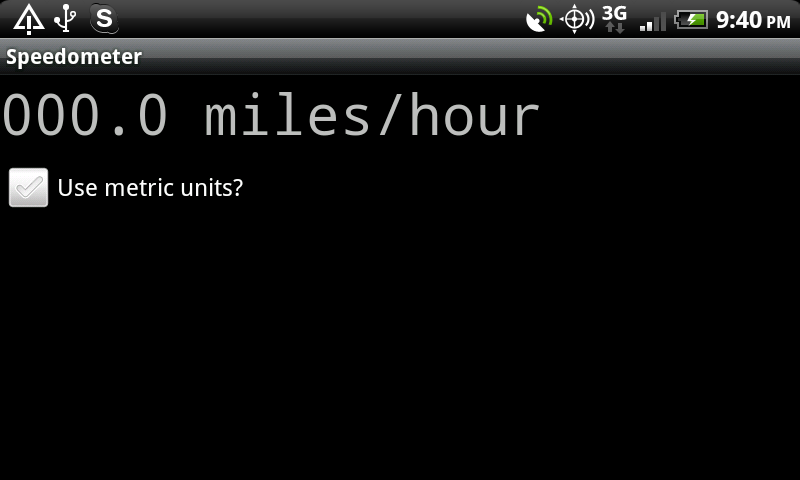 I’ve seen lots of questions concerning the use of the GPS functionality in Android. It’s super easy, but some of the explanations are needlessly complicated. The code below is a simple speedometer that uses the GPS chip to show your current speed. There are optimations that can be made (specifically in the “locationManager.requestLocationUpdates” call), but this is good enough to get you going. The Android API documentation should fill in the gaps. As always … take it, run, and share with the rest of us. Check out the interface and class below, and make sure to see the previous post for the “CLocation” class. // TODO: do something one day? please i need this for my project purpose. Is this code is working..??? I have not played with this code in quite some time, and I have no idea where the Eclipse project had gone off too. There’s been a good bit of interest in it so I may try to resurrect it soon. Work and family has me pretty busy these days though. Really though, all of the code is here. The rest shouldn’t be that hard. Hey folks, I’ve updated this post with a link to source files. Have fun! Take a look at the new video above. It should clear things up.